“An Evening With Toulouse-Lautrec” is introduced Wednesday night at the Block Museum of Art. The exhibit was curated by a Northwestern art history class through Fall 2014. The Block Museum of Art held an event Wednesday evening organized around a student-curated exhibit of works by French artist Henri de Toulouse-Lautrec. The exhibit is titled “Toulouse-Lautrec Prints: Art at the Edges of Modernity” and includes 18 pieces ranging from posters to theater programs. The project has been in the works for two years and was first suggested by Block Museum director Lisa Corrin, said Prof. S. Hollis Clayson, whose Fall Quarter 2014 art history class reunited to speak about the exhibit Wednesday night. The pieces were donated by NU alumnus Irwin Press (Weinberg ’59) and his wife Andra Press. “Their holdings in Lautrec are so deep and they have such good quality work,” Clayson said. 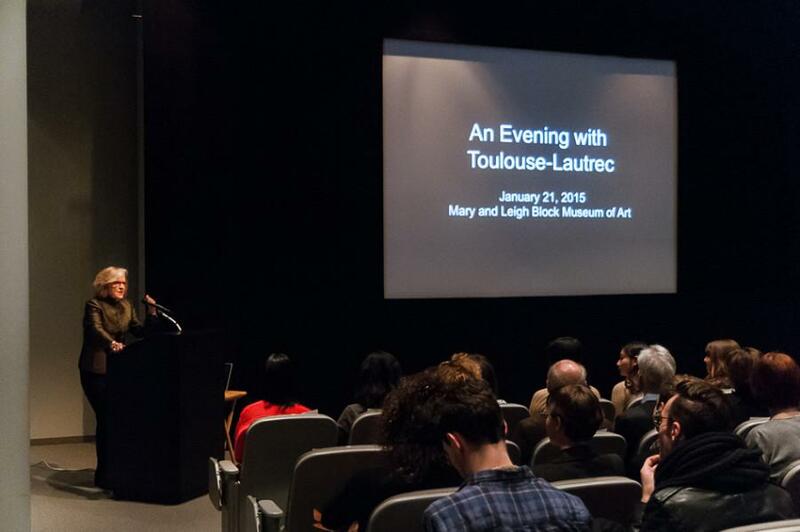 More than 50 people attended the event, which began with a lecture by Clayson about Toulouse-Lautrec’s career. Her 13 students then presented their research on their respective works. “I think it’s challenging to focus on one single work for the entire quarter and then later on to write about that one piece, but that’s also the rewarding part because detailed viewing usually gives more than what you first assume,” said Weinberg senior Sharon Chen, who was a student in Clayson’s class. The course allowed the students to have access to quality artwork and gave them the chance to experience curation. “One of the really cool things was that the students were involved in each step of the decision making processes from little things like choosing the wall colors to the big things like choosing which pieces get to be in the gallery,” said class member Yun Lee, a Weinberg senior. Among the attendees were Irwin and Andra Press, who got to see their pieces displayed in a museum setting. Irwin Press said he and his wife were so impressed by what the students accomplished they have decided to bequeath their art to the Block Museum. According to Clayson and her students, the prints belonging to the Press family are in even better condition than the ones at the Museum of Modern Art in New York City. People are encouraged to visit Block and see the display as the exhibit will remain available for viewing in the Katz Gallery until April 15. “I think each wall has its own story, so I hope people get something out of it,” Lee said. This is not the last student-curated exhibit to be featured at Block, as Clayson hopes to continue holding these art history classes.